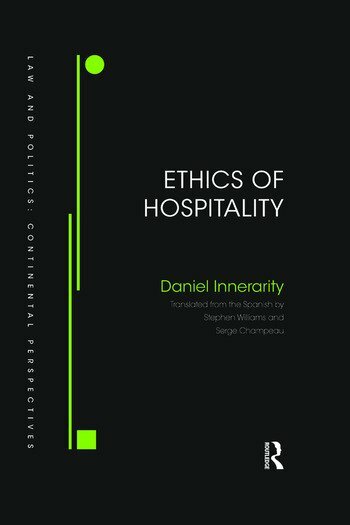 The source of hospitality lies in the fundamental ethical experiences that make up the fabric of the social lives of people. Therein lies a primary form of humanity. Whether we are guests or hosts, this reveals our situation in a world made up of receiving and meeting, leaving room for the liberty to give and receive beyond the imperatives of reciprocity. This book proposes an ethic that promotes the possibility of stirring emotion before that of protecting ourselves from unexpected encounters. Fundamental ethical competence consists of opening up to the wholly other and to others, to be accessible to the world’s solicitations. There is moral superiority of vulnerable love over control and moderation, of generous passion over rational prudence and of excess over exchange. Constructing an ethic of hospitality is essential at a time when we are torn between the imperatives of modernization and growth and the demands of concern and protection. The experience we all have today, that of the fragility of the world, is giving rise to a powerful tendency toward solicitude. From such a perspective, the duty of individuals no longer consists of protecting themselves from society, but of defending it, taking care of a social fabric outside of which no identity can be formed. Daniel Innerarity is a professor of Philosophy at the University of the Basque Country (Spain) and a researcher at the Basque Foundation for Science (Ikerbasque). As a Doctor of Philosophy, he has carried out research in Germany, as a fellow at the Alexander von Humboldt Foundation, in Switzerland, Italy and France.